It is against the law for a mother to be homeless with children in New Hampshire. The Armed Forces – they sacrifice their lives to protect Americas freedom abroad and at home. This week, we were blessed to have some of them give of their time and talents here at Lydia’s House of Hope! 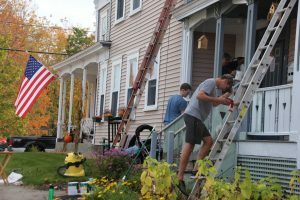 The volunteer workers helped with outdoor clean-up projects, interior and exterior painting and assisted us in moving furniture to accommodate new families moving into the home. The residents at Lydia’s House of Hope prepared a delicious lunch for our workers (with the help of UNH Cooperative Extension) and we enjoyed time of fellowship together. Thank you to these generous individuals for caring and sharing their gifts with us. Hope changes lives.